A gigantic whale slowly swims through the water, searching for a salty snack. Will the tiny fish outmaneuver and outrun this enormous beast, or will his entire school become lunch? Slip on this fun pair of mittens and you can act out this scene and many others, all while staying warm. The high quality wool will feel great against your skin, and the amusing characters will make this pair a favorite all winter long. They are the ultimate in attention getting outerwear, and allow you to bring a bit of silliness to everyone around you. Dip, dive, swim and chomp. Fight it out with this pair of mortal enemies to see who will come out on top. Will the peaceful fishy duck into some coral in time, or will class be held in the belly of the whale? One hand can't help but start a fight with the other when you are sporting these seaworthy mitts. Stay nice and toasty without compromising personality. It is hard to say if these are more fun or functional. You won't be able to help but play with them, but because they are such a nice quality mitten, you also will notice how soft, thick and warm they are. The material is a bit stretchy, so one size will fit most hands. Perfect as puppets or mittens, you will be able to act out your favorite National Geographic style scenes, or get all boring and just use them to protect your hands from cold weather. Find yourself deeply entrenched in an epic battle as you commute to work, or let the mighty whale score you some fish sticks at lunch time. Amuse your friends or family members, and surprise unsuspecting strangers with these animal theme mittens. Kids love it when adults wear them, and adults who are kids at heart can't help but love them too. They add excitement and playfulness to an otherwise dull piece of clothing, plus they are high quality and nice and warm when they are on. 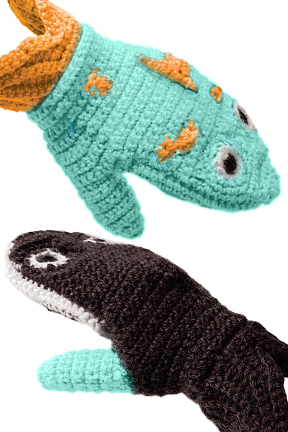 You’ll love your Predator vs. Prey Whale and Fish Mittens so much you will be preying for snow, and happy when the temperature starts to fall. Predator Vs. Prey Mittens: Whale and Fish - An innocent little fish has no chance against a humongous whale. Or does he? Speed may just win out over strength in this pairing of animal kingdom enemies. This classic rivalry never gets old. Order Yours Today!